What determines the FHA Loan Limits for each County? The Federal Housing Administration (FHA) calculates the mortgage loan limits based on the median home prices in accordance with the National Housing Act. FHA’s single family mortgage loan limits for forward mortgages are set using Metropolitan Statistical Areas (MSA) and county areas. FHA publishes updated limits effective for each calendar year. FHA sets the maximum FHA Loan limits at or between the low-cost area and high-cost area limits based on the median home prices for the area. What are the New Delaware FHA Loan Limits for 2019? The FHA Loan limits are the same for a standard Delaware FHA Loan as well as a Delaware FHA 203k Loan. The FHA Reverse Mortgage Loan limits are different that than the forward mortgage limits. What are the FHA Loan Limits for High Cost Areas? How Do You Apply for a Delaware FHA Loan? You can apply for a Delaware FHA Loan by calling 302-703-0727 or you can APPLY ONLINE with the John Thomas Team with Primary Residential Mortgage. Ask a Lender put John Thomas at #1 Delaware FHA Lender and at #1 Newark, Delaware FHA Lender for 2018. Visit our Delaware FHA Loan page for more information on how we can get you into your dream home today or Call 302-703-0727 to get started today. GET STARTED ONLINE. Ask a Lender surveyed all of the Delaware Loan Officers that originated FHA loans through data provided to the Scotsman Guide and determined that John Thomas was the Number 1 Delaware FHA Loan originator because of his affordable FHA mortgage loans and award-winning client service. 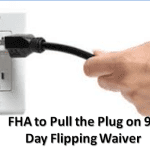 FHA Property Flipping Temporary Waiver on the 90 Day Rule will expire on December 31, 2014, and will not be extended as announced by the Federal Housing Authority on December 11, 2014. This is important news for investors and home buyers to be aware of starting January 1, 2015, as investors will need to wait 91 days before they can execute a sales contract on a flip for a buyer using FHA financing to purchase the property. The waiver applies to all sales contracts executed on or after February 1, 2010, until 11:59 PM, December 31, 2014. FHA deems a sales contract to be executed when all parties to the contract have signed the contract, and the contract is enforceable under the law of the state the property is located. Mortgages that are made on properties in which sales contracts have been executed after 11:59 PM, December 31, 2014, are not eligible for a waiver of the regulation prohibiting property flipping. FHA stated they will not extend the waiver beyond December 31, 2014. On June 7, 2006, HUD published a final rule in the Federal Register prohibiting property flipping on the FHA Mortgage Loan Program. The property flipping rule and became effective for mortgages endorsed for FHA insurance on or after July 7, 2006. A waiver to this rule was issued on February 1, 2010, which allowed individuals to sell homes within 90 days of purchasing in order to help the weak housing market that was being hampered by the glut of foreclosures. c) that for resales that occur between 91 and 180 days where the new sales price exceeds the previous sales price by 100 percent or more, FHA will require additional documentation validating the property’s value. FHA also has the flexibility to examine and require additional evidence of appraised value when properties are re-sold within 12 months. Sales by other United States Government agencies of single-family properties pursuant to programs operated by these agencies. Sales of properties by nonprofits approved to purchase HUD-owned single-family properties at a discount with resale restrictions. Sales of properties that are acquired by the sellers by inheritance. Sales of properties purchased by employers or relocation agencies in connection with relocations of employees. Sales of properties by state and federally charted financial institutions and Government Sponsored Enterprises. Sales of properties by local and state government agencies. Upon FHA’s announcement of eligibility in a notice (i.e., ML), sales of properties located in areas designated by the President as federal disaster areas, will be exempt from the restrictions of the property-flipping rule. The notice will specify how long the exception will be in effect and the specific disaster area affected. Delaware FHA Loan Limits for 2015 Announced by Federal Housing Administration on December 5, 2014, in the mortgage letter 2014-25. The mortgage loan limits published in this mortgage letter go into effect for FHA case numbers assigned on or after January 1, 2015, and will remain in effect through December 31, 2015. The FHA Loan Limit is calculated by taking 115% of the median home price in that county as calculated by HUD. The “floor” still remains at $271,050 so if 115% of the median home price is below the floor then the loan limit is set at $271,050 such as in Kent County, Delaware. FHA also left the maximum FHA Loan Limit in high price areas at $625,500. The new loan limits apply to all FHA Loans including FHA 230k Rehab Loans and FHA Streamline Refinance Loans as well FHA Reverse mortgage loans. Delaware FHA Loan Limits for 2014 will be going Lower for FHA case numbers assigned on or after January 1, 2014. FHA mortgage maximum loan amounts vary by states and by regions based on the median home price in that region. Currently, FHA loan limits range from $271,050 up to $729,750. FHA Backed about one-third of all purchase loans in 2013 and now is looking to not provide loans to the high-end real estate market anymore. The higher loan limits were on a temporary extension authorized by Congress but this extension expires December 31, 2013, so without Congress passing legislation, the higher loan limits are expiring. The big surprise is FHA has decided to change how it calculates the maximum loan limit and that is why loan limits are changing in most regions even if not at the high end of the real estate market such as Kent, New Castle, & Sussex County Delaware. The current calculation uses 125% of the median home price for the region. January 1, 2013, FHA is changing the calculation to only 115% of the median home price so that is why maximum loan limit is going down in all three counties. Everyone expects the rollback in high-cost area loan limits but nobody was expecting the drop from 125% to 115% of the median home price as this affects almost all regions. HUD Delays the Ban on Dual Agency for Short Sales on Properties with FHA Loan being sold short. The rule was to go into effect on October 1, 2013, as outlined in mortgagee letter 2013-23 released in July 2013. The rule stated that brokers and their agents may only represent the buyer or the seller, but not both parties. This is commonly called dual agency so the rule thus makes it illegal for an agent that works for the brokerage of the listing agent to represent a buyer in the purchase of a short sale. The intent of the rule is not to limit real estate agents but was to limit the risk of fraud and to ensure “arms-length” transactions on short sales and deed in lieu of foreclosure. There has been rampant fraud being performed with some agents listing homes for short sale and selling them to other agents below the market price by not taking any other offers to the bank. The same thing has been happening on REO properties that have been sold by agents that sell them to a partner at below market value by not taking any other offers to the bank that is selling the property. The intent of the rule is well-intentioned but it would actually hurt sales of homes with FHA loans that need to be short sold as it would mean a lot fewer agents taking short sales if they couldn’t sell the home to any other agent that worked under the same brand name. HUD had originally proposed the policy change because HUD’s inspector general had detected fraud and abuse in the pre-foreclosure sales process. The National Association of Realtors cited many problems with the new rule such as violating some state laws and also some laws for listing properties on the MLS. It seems HUD has responded to the complaint by NAR and has delayed implementation of the rule so as of October 1, 2013, there can still be a dual agency on Short Sales.